Cere greenish yellow; irides golden yellow; legs dirty yellow. 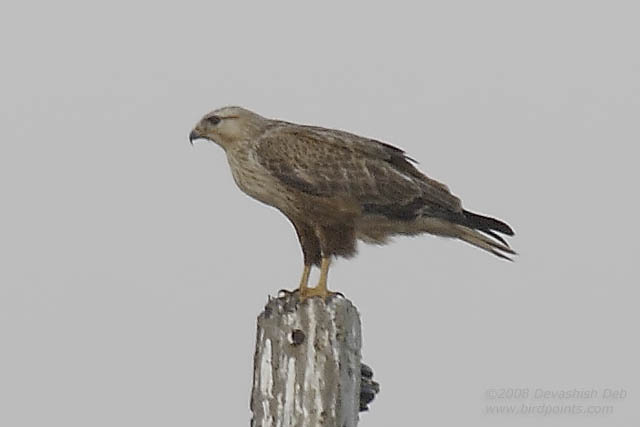 Length, male, 23 to 24 inches; extent 56; wing 16 to 17; tail 9; tarsus 3 1/4; bill at gape 2.-Female 25 to 27 inches; wing 18 to 20; tail 10 to 11. The wings nearly reach to the end of the tail. Weight, male 2 1/2 lbs; female 3 1/4. In some the eye is dun or brownish yellow. It is large, and the eyebrows are very prominent. 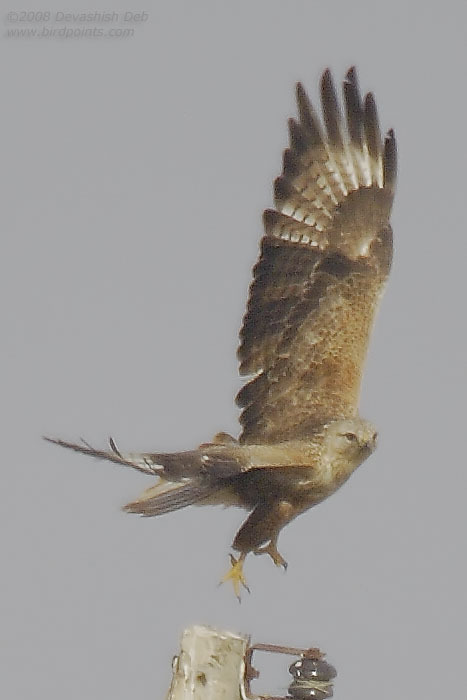 This handsome Buzzard is found throughout all the northern and central parts of India, frequenting the plains and low cultivated lands, especially irrigated fields, edges of tanks, &c. I have met with it in the Deccan, and in Central India, but most abundant in the Gangetic valley above Dinapore. It is also found in Nepal, and all the sub-Himalayan regions. It generally sits on a low, tree, and watches for rats, frogs, lizards, and large insects, which it pounces on from its perch, or rarely takes a hunt over the ground in quest of food. Mr. Elliot says, it is very abundant in Guzerat, preying on the numerous a field rats of that proving, (Mus indicus). Captain Irby took four rats swallowed whole out of the stomach of one he killed in Oude. Mr. Hodgson says, Feeds on snakes, rats, and mice; also on quail, snipe, and partridges, which, however, it only seizes on the ground.' He also says that it kills duck and teal, but he attributes to it a much speedier flight than my experience has shown. Jerdon, T.C. 1862. The Birds Of India. Vol I, II & III.